Police have blocked the National Juma special prayers that were scheduled to take place today Friday at Kololo ceremonial grounds. The prayers which were organised by MPs Muhammed Nsereko (Kampala Central) and Latif Ssebagala ( Kawempe North) were to pray for the lives of Muslims who have been killed, arrested and tortured. Over a dozen Muslim clerics have been killed from various parts in almost similar style over the years. Also, police, especially during the former reign of police chief Gen Kale Kayihura, made it a habit to arrest Muslim suspects in droves whenever a high profile murder occurred. Most of the suspects would later be freed by courts for lack of evidence but always complained of torture whilst in detention. At Kololo ceremonial grounds, there was heavy deployment of police with limited access. In December, Nsereko and Ssebagala wrote to the inspector general of police Martin Okoth Ochola and the chief of defense forces Gen David Muhoozi seeking permission for the prayers. Muhoozi cleared the prayers but on condition that Ochola also does the same. However, Ochola has never responded to the letter. A press statement issued on Friday by Nsereko noted that it was an injustice to the Muslim community for the police not grant permission. "We, therefore, call off our National Special Juma prayers which were supposed to take place Friday 18th January 2019 and this is an indication that Kololo ceremonial grounds can be accessed by all Ugandans apart from Muslims. These are the injustices we are fighting," reads the statement in part. Kololo has been previously been a preferred venue choice for other religious denominations, political parties and companies due to its accessibility and vast space. That is why Isa Masiya advised his believers not to make prayers a SHOW-OFF(Exhibition). If you want to pray to your God, go home and into your bedroom, and lock up the doors and then start your prayers in secret. If the Ugandan Christians want to mislead other religiuos believers to make spiritual prayers a public spectacle that is very unfortunate indeed. "Naye alizaala omwaana wa bulenzi; naawe olimutuua erinya lye Yesu; kubanga ye y'alrokola abantu be mu bibi byabwe. Ebyo byonna byakolebwa, bituukirire Mukama bye yayogerera mu nnabbi, ng'agamba nti, laba, omuwala atamanyi musajja aliba olubuto, era alizaala omwaana wa bulenzi, balimutuuma erinnya lye Emmanweri; amakulu g'alyo nti Katonda ali naffe." Okusinza nokuyimba mu kkanisa e Bungereza okwolulimi Oluganda. I must concede upfront, and paraphrase former Kampala Mayor Nasser Sebaggala: I am not ‘cumbersome’ in matters of religion and spiritual being. I know very little theology and engage in very limited religious praxis. Over the years, I have maintained a private routine of a short prayer as I get out of bed every morning. Much like other matters of the heart and soul, faith and spirituality is a fundamentally personal matter that should not be showcased let alone subjected to any form of public approval. The hypocrisy of religious piety has been on full display in Uganda in the recent past. We have had an explosion in religiosity in tandem with sheer breakdown of the most basic moral fabric that undergirds a society. While growing up as a little boy in the 1990s, across several villages, there was one Catholic church, one Anglican church, and one mosque. Many people had to walk several kilometers to get to any of these prayer places. In a spell of less than twenty years, today, there are several churches within five minutes of my ancestral home in Bubulo. A few young men who only yesterday lived modestly as semi-skilled workers are now highly regarded pastors, performing ‘miracles’ and delivering people out of their problems, including purportedly healing the sick. There has been an astounding if sobering transformation that deserves a carefully empirical investigation. Yet one must note a solid square-up between proliferation of evangelism and runaway depravity: violent crime, blatant theft, glaring dishonesty, and the sheer absence of the ethos and values that would be expected of a God-fearing people. This gets worse as one moves to the city, the centre of religious riches and moral bankruptcy. We don’t just have countless religious entrepreneurs, savvy enough to set up houses of prayer or take God’s ministry to a five-star hotel; it has also become impeccably fashionable to wear a born-again badge regardless of one’s actual lived practices and everyday actions. Now, it’s possible that the breakdown of a moral social order at the same time as runaway religious saturation are two entirely different developments each of which has nothing to do with the other. But it is also logically possible that the gospel that Christ died for our sins and that all you have to do is openly, and this is the key word, declare that He is Lord and Saviour means that you can spend the night in prayers and the day in debauchery, lying, fleecing, cheating, etc., and then return to the Lord and ask for forgiveness. This is especially in the religious free marketplace where the Bible is available for convenient interpretation and believers can choose where to invest their spiritual time and money. The social media buzz this week turned on a self-styled ‘prophet’, Elvis Mbonye. I first heard about him from my wife, as a man of God leading a ministry of prophecy. Now, in my utter religious ignorance, I have had the invaluable benefit of a partner who is better informed in these matters and has had the grace and patience of keeping up with a questioning man who betrays relentless skepticism. I pressed on about the ‘prophet’. The ministry was convening in Imperial Royale hotel, one of the most expensive hotels in Kampala. Before long, venue shifted to Hilton, a five-star hotel. Then financial pledge-leafs appeared on Facebook: Shs 100,000 being the minimum. As if something is not right here! What about poor me of very modest means but would like to contribute Shs 20,000 to the ministry? Last week, one of Uganda’s finest and highly regarded sports journalists, Joseph Kabuleta, wrote in the pages of The Observer declaring Mbonye a ‘national asset’. Apparently, with the ostensibly God-given capacity to foretell, Mbonye can help the national intelligence and defense apparatus on matters of war and other crucial aspects of national planning and decision-making. Days later, a few Facebook pictures riled many, most of all showing someone who looked like Kabuleta in a surreal scene. Mbonye seems to have moved beyond a ‘prophet’ to a god to be directly worshipped, with followers prostrating and kissing his shoes. There is the bit of paying for prayer and the splendor of place, attire, and cars, all of which will most likely outrage Christ were He to appear. But Mbonye is on record confessing to have physically met Christ, not just once. In the free marketplace of religious belief and practice, this is all fine. Some have rhetorically asked of any complainant or if those who flock to the newest ‘prophet’ or buy ‘holy’ rice and water from an old one are not adults capable of making informed decisions. In other words, there is nothing wrong with a prophet for profit. In the bigger scheme of things, however, there is a moral crisis engulfing us. Mbonye might be attracting the rich of Kampala and can receive Shs 5 million in individual offertory. Yet there is every possibility that the so-called well-off in fact exist on very shaky economic ground and social foundation, precisely the reason Mbonye is a god to be worshipped. It’s a deep national tragedy that betrays the poverty of our times. Papal Nuncio Archbishop Augustine Kasujja. The first black Papal Ambassador Archbishop Augustine Kasujja has been transferred from Nigeria to Belgium. The Ugandan, who has served the Holy See for many years, was moved after six years of “meritorious service” in the west African nation. He becomes the first non-European pope’s ambassador to Belgium. During Kasujja’s time at the Apostolic Nunciature, the Catholic Church in Nigeria witnessed tremendous growth in both spiritual and pastoral activities, according to a statement from the Catholic Secretariat. "For so many years the Vatican never had a native African ambassador. It was not until 1998 that an African was appointed as a representative of the Pope," read the missive. Kasujja, 70, was ordained a priest on January 3, 1973 and was appointed Archbishop of the titular see of Cesarea in Numidia in 1998. He arrived to serve as Apostolic Nuncio to Nigeria in 2011. The late Pope John Paul II appointed him to be his ambassador to Tunisia and Algeria on May 26, 1998. Just as Archbishop Dr. Joseph Nakabaale Kiwanuka rejuvenated Africa by pioneering the Black African episcopacy, Kasujja also regenerated Uganda and the African continent through this awesome attainment. He served in the Apostolic Nunciatures of Argentina, Haiti, Bangladesh, Portugal, Peru, Trinidad and Tobago, Algeria, Tunisia, Mauritius, among others. Traditionally one of the strongest non-state institutions in Uganda, the Catholic Church faces a stern test to its unity in the shape of charismatic priest Jacinto Kibuuka. But as SADAB KITATTA KAAYA reports, some in Lubaga see in all this the long, rich hand of President Museveni. In the run-up to the July 12 suspension of charismatic preacher Rev Fr Jacinto Kibuuka, President Museveni tried severally but failed to reconcile the priest and Kampala archbishop Dr Cyprian Kizito Lwanga, The Observer can reveal. And in a matter that could have significant implications for church-state relations, it has emerged that the president once encouraged Fr Kibuuka to operate on his own instead of fighting with the Catholic leadership. Kibuuka has since taken up the advice, by starting his own church. One of Museveni’s reconciliatory meetings, according to insider sources, took place in late June at State House Entebbe, two weeks before the archbishop penned the five-page letter suspending a priest who was once his confidant. Sources familiar with the failed reconciliatory meetings have told this writer that the archbishop turned to President Museveni after he failed to rein-in the errant priest through the formal church structures. In the letter, Lwanga, who accuses Kibuuka of being disobedient, also alluded to some “numerous chances of dialogue and reconciliation” which Kibuuka passed up. At the time, The Observer understands, Kibuuka had already made up his mind to part ways with the mainstream Catholic Church and had started his own Mamre Prayer centre at Jjanda, Namugongo, in Wakiso district. Kibuuka’s move to Jjanda, according to sources, was suggested by President Museveni after he realized that the priest couldn’t be reconciled with the archbishop. “It was clear that he was not willing to take the penal remedy or serve any punishments, and the archbishop had no ways of enforcing the punishment or stopping him. So, the president advised that he gets off any facilities claimed by the archbishop and he [Kibuuka] gets a private premise for his activities,” a source said. At the time, Kibuuka was operating from an open space owned by the congregation of Sisters of St Francis at Namugongo near the Catholic’ shrine. From the Entebbe meeting, Kibuuka told his congregants that they had to relocate and Shs 200m was promptly raised to buy the land at Jjanda. A source close to the archbishop’s office, however, pointed to a possibility that the money could have come from the president. “He [Kibuuka] is [an NRM] cadre and gets all the support that he wants from Museveni,” the source said. Talk around Lubaga hill, the seat of Kampala archdiocese, suggests Kibuuka grew wings in part because of his links to the president. But Kibuuka rejects that claim. “The president is not a church leader and he has no hand in this and in any way not interested,” Kibuuka said at Mamre centre on Thursday. “The reasons are internal between me and the archbishop, and if there is any priest that the archbishop has ever reported to the president, it is me,” he added. Kibuuka confirmed that Museveni tried to mediate a settlement between him and Lwanga but failed. According to insiders, Kibuuka went for the State House meetings accompanied by lay Christians, while archbishop Lwanga attended with the vicar general of Kampala Archdiocese Msgr Charles Kasibante, Msgr Expedito Magembe of Bukalango, and the late John Baptist Mukajanga, among others. In some of the meetings, Museveni brought the chief of defence forces, Gen Katumba Wamala, who he asked to help reconcile the two parties. Senior presidential press secretary Don Innocent Wanyama denied knowledge of the Kibuuka meetings because they are not reflected on the president’s official programme. And an MP who reportedly attended the meetings could only confirm that indeed they took place. “I am a Catholic, and not merely a Catholic but a strong one; I will not tell you anything,” the MP said before hanging up. Efforts to speak to Gen Katumba Wamala about his role in the matter failed, as his known phone number was out of reach for most of Friday and Saturday. According to insider sources, Magembe and Mukajanga were drawn into the meetings because Kibuuka accused them of being behind a plot to defame him using a 23-year-old woman, Winfred Nantongo. In a widely-publicized row, the woman accused Kibuuka of threatening violence and sexual harassment. The duo (Magembe and Mukajanga) plus two journalists as well as Nantongo were later charged at Mwanga II court with criminal defamation. According to Lwanga’s letter, which has been sent far and wide, and read before Christians in church, Kibuuka was on March 8 given administrative leave (Penal remedy) under Canon law 1339 and 13340 and stopped from conducting any public liturgical celebrations and prayers of healing. He was transferred to Ggoli parish in Mpigi; but he rejected the transfer, leaving Lwanga livid. 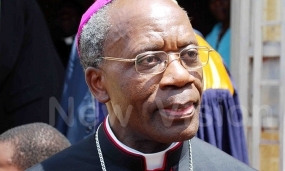 Lwanga’s letter also highlighted the circumstances under which he (Kibuuka) got to reside at the archbishop’s residence when he served as the Lubaga hospital chaplain. It was at Lubaga that tales of Kibuuka’s miracle powers drew crowds to him, giving him power that pulled him away from the Church establishment. He was later transferred to Mt Sion Bukalango prayer centre. (See ‘Pentecostal’ priest upsets Catholic Church, transferred, The Observer, November 17, 2014). Kibuuka’s transfer to Bukalango only opened new fights between him and Magembe, the head of the popular charismatic Catholic shrine. According to some sources, it was an egoistic fight between the two as each claimed to have superior healing powers. To calm tempers, Kibuuka was moved to Namugongo martyrs’ shrine to coordinate the planned golden jubilee celebrations for the canonization of the Uganda martyrs, which were graced by Pope Francis last year. He was also to promote the devotion to the martyrs as well as coordinate the activities for the pope’s visit. “Unfortunately, while holding that position, he made a serious diplomatic error at the Apostolic Nunciature and he was asked to step down from this office,” Lwanga wrote. While Lwanga’s letter does not give details of the nature of the “serious diplomatic error”, church sources have told this writer that while at the nunciature (residence of the Papal Nuncio) at Mbuya, Kibuuka demanded to inspect the room where the pope eventually stayed during his three-day visit. Kibuuka debunked this narrative, arguing that the times he went to Mbuya as coordinator of the papal visit, he was always with members of the national organizing committee. “I am talking of security heads and officials from the Office of the Prime Minister and State House. I also know that it [nunciature] is an embassy, which I can’t just play around with,” he said. After he was replaced on the papal visit committee, Kibuuka, according to Lwanga’s letter, was supposed to continue promoting the devotion to the martyrs but under the authority of the parish priest of Namugongo. However, Lwanga noted, Kibuuka’s services became destructive to normal church practices before he became disobedient to the church authorities by conducting prayer services without the jurisdiction and pastoral harmony of the legitimate church authorities at Namugongo. 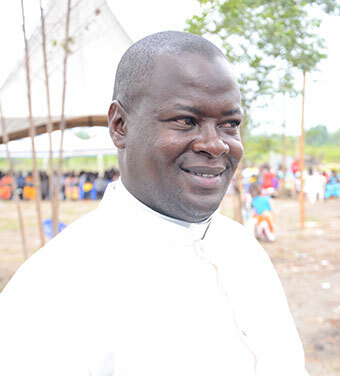 “Now that Fr Kibuuka has finally decided to fracture the unity of the church and the people of God by setting up his own prayer centre and congregation which he calls Mamre prayer centre – Uganda without the explicit knowledge and permission of the ecclesiastical authorities, we find it necessary and urgent that the Catholic community and the public at large know the truth of the events,” Lwanga wrote. He further noted that Kibuuka’s centre is not a gazetted or recognized place of worship under the Roman Catholic Church. To Kibuuka, Lwanga’s letter meant that he (Kibuuka) was no longer wanted in the Roman Catholic Church and that is why he had to break ranks and join the Evangelical Orthodox Church. The falling out, according to different sources both at Lubaga and Jjanda, is also about money. For instance, sources at Lubaga pointed to an alleged claim by Kibuuka of Shs 150m share of the Shs 500m that President Museveni donated to Bukalango shrine when he went there on August 15 last year. Kibuuka is said to have invited Museveni to the shrine, to counter former prime minister Amama Mbabazi who had been hosted at the Kiwamirembe shrine by the Eucharistic Apostles of the Divine Mercy. Kibuuka himself refused to respond to these allegations because he does not want to “further engage” Lubaga. But some of Kibuuka’s adherents told The Observer that problems started when the church leadership noticed that he was making record collections from the offertory at his services. “That is how we raised the Shs 200m within two days to buy the land at Jjanda where the centre was relocated to,” one adherent told The Observer. Mamre prayer centre sits on two acres of a wetland less than two kilometers from the Anglican Martyrs’ shrine at Namugongo. 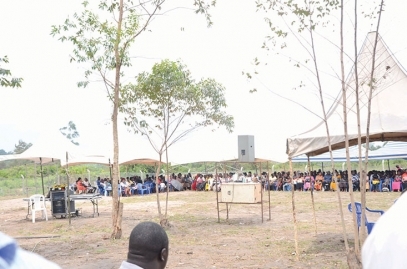 Congregants sit in tents spread in the freshly- cleared eucalyptus forest waiting for their turn to meet the charismatic preacher seated in a small tent about three hundred metres away under the watchful eye of plainclothes security men. “All these people come with different problems, and many can give testimonies about his [Kibuuka’s] mystical powers,” an aide to the rebel priest said. On July 13 when he announced his defection from the Roman rite of Catholicism to the Antiochian rite, Kibuuka also announced that as an ordained and innocent Catholic priest, he would go on with the performance of his priestly duties. “I will continue celebrating the mass of St Chrysostom in the Antiochian rite and I will continue offering all the sacraments of the Catholic Church in that rite,” Kibuuka vowed. He denied that he was being disobedient to the archbishop. “Obedience is only when the superior is virtuous,” he told The Observer without elaborating but wondered why Lwanga had not taken any action against the priests that he (Kibuuka) had accused of tormenting him. When I meet Joshua Senfuma at Namirembe, he is more concerned that some children have not been served lunch. “Go inside and get your sodas. We have lots of things to serve all of you. I want to see everybody seated, eating and happy because this is your day,” shouts Senfuma, a senior Sunday school teacher at Saint Paul’s cathedral, Namirembe. Senfuma is so focused on the little ones during the interview that he eventually asks me to meet him the following day. I watch him from the sidelines as he comforts a crying young girl asking to see her sister. Nicknamed Uncle Tom, Senfuma, 64, was named Tom by his late grandfather, Thomas Senfuma, one of the first eight native Christians to be ordained Anglican priests in Uganda. “All the children and some adults I taught don’t know my full name. They call me Uncle Tom,” he says. 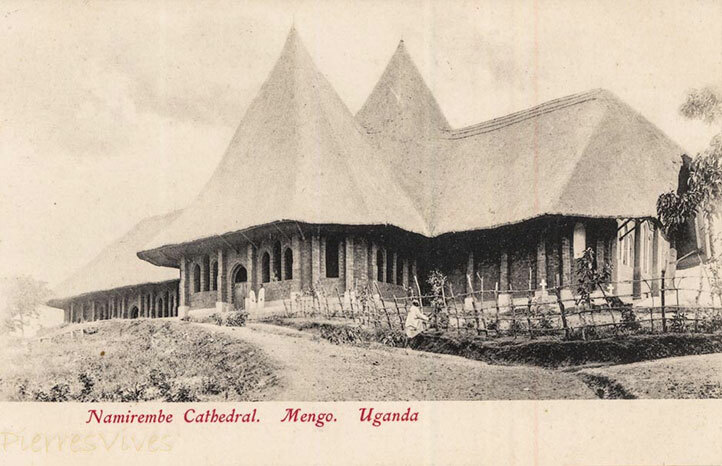 On Sunday, November 15, Senfuma will be among the many congregants celebrating Uganda’s biggest cathedral’s 100 years, since 1915, at Namirembe hill. For Senfuma, it is particularly special since he has voluntarily served the Sunday school for 47 years, meaning some of the congregants as old as 50 in the main cathedral, passed through his hands. Also, when Senfuma was born on March 3, 1951 at Mengo hospital, he was baptised the following day in the current cathedral. Living just a few metres from the church, Senfuma joined the Sunday school at five years. “We used to pray from a chapel at Mengo girls’ school [now Mengo primary school] because it was nearer to the cathedral. Our teacher was the late Nnaabagereka who taught about 10 to 15 children every Sunday,” he says. In 1967, Senfuma joined the church as a Sunday school teacher with Canon Dr Yokana Mukasa, the then dean of the cathedral, and later bishop of Mityana diocese. By this time, the Sunday school had been shifted to the old synod hall located in the lower grounds of the cathedral but with no teacher, save for Stephen Kaddu who had been volunteering for two years. The old synod hall came with a dilapidated floor, dusty walls, wooden windows and doors and a banana-fibre ceiling that was a haven for cockroaches and bats. Senfuma was later joined by the late Sister Julliet Mayanja and Prillah Billington, a daughter to Dr Roy Billington for whom a ward was named in Mengo hospital, having served there for a long time. With the Sunday school having 20 to 40 children, the Church devised ways of attracting more children. Masaba soda can be compared to today’s brands such as Fizzy and Riham, but the containers were metallic and fitted in wooden crates. Any child who attended the last Christmas party would definitely come back to church next time. Senfuma, however, says the biggest party that attracted more people was in 1977 during the centenary celebrations of Church of Uganda. Even when he joined secondary school at Pillais secondary school, an Asian school, now the location of Post Office along Kampala road, he continued to dedicate some time to the children. As Senfuma and other teachers taught children about God, they had to deal with children from poor, middle- income and rich families. He says some children would swing on the six pillars inside the synod, remove spokes from his Vespa motorcycle and Senfuma, also skilled in metal fabrication and carpentry, would ignore them. The Observer sports editor David Lumu, and cathedral organist Paul Luggya. Others are son to the late canon Samuel Mpalanyi – Joel Musasizi; the cathedral warden Paul Kitatta; Reverend Nathan Ntege, a vicar in England; Saulo Bulega Bwewussa who was a cathedral chorister for close to 40 years; and Dr John Jaggwe, a consultant oncologist at Mulago hospital. According to Senfuma, the overthrow of Idi Amin in 1979 and the political turbulence that followed, escalated the number of refugees, forcing many people to stay around the cathedral. More children joined Sunday school and today, the ministry located in the refurbished synod hall, is home to about 500 children from toddlers to 13-year-olds – thanks to the leadership of former dean Canon Augustine Musiwuufu Magala (1999 to 2009). “We had many deans but he [Musiwuufu] loved children so much. In the past, we were sitting on mats and benches but his regime managed to get us plastic chairs,” Senfuma, a father of five, says. Children who attend the 8:30am service are taught in English while those at 10:30am in Luganda. Senfuma says the services are in accordance with the languages used during the adult services. Because of his long stay in ministry, Senfuma also knows many people who have literally grown with the cathedral, such as Ephrance Musoke, 84. Having prayed from the cathedral since 1941, Jjajja Ephrance Musoke still leaves her home in Bukesa to go for prayers at the cathedral every Sunday. When I visited her home last Wednesday, she was looking forward to celebrating the 100 years of a cathedral whose maintenance she participated in as a young child and in which she was wedded on June 16, 1947. On November 14, Musoke will join other couples who have exchanged marital vows in the cathedral since 1915, for a thanksgiving service as part of the centenary celebrations. “If they give us a band to lead the procession, I will be very excited. I will march majestically because that church is standing because of the generous work done by people like us,” she boasts as she looks at her golden wedding band. Her husband, Clementi Kyambadde Musoke, died on May 19, 1986. She is, however, happy to see a tremendous change in the cathedral during the reign of incumbent diocesan bishop, Wilberforce Kityo Luwalira. Senfuma, who witnessed the re-roofing and renovation of the cathedral, agrees with Musoke that the church has changed for the better. “The cathedral had many card boards up but they were replaced with roofing tiles through the Ttegula project. We had three rows of pews in the past and the other parts filled with chairs. If we have pews throughout, these are very big achievements,” Senfuma says. Musoke explains that the cathedral would conduct wedding and baptism ceremonies only at 3pm on Saturdays until 1957 when the programme was changed to handle more weddings. Musoke fondly remembers one white man, Patterson, who volunteered to keep the cathedral grounds beautiful by tending the flower gardens, mango trees, and grass. “If that mzungu ever caught you plucking the flowers or walking on the grass instead of walkways, he would beat you. All the beauty we see at the cathedral now is because of his strictness,” Musoke says. Every Thursday, Musoke finds time to conduct pre-marital counseling sessions to couples intending to wed at the cathedral. One day that will always be remembered by Anglicans was the locking out of Archbishop Ericka Sabiiti at the main entrance to the cathedral. In 1967, Sabiiti had been appointed the first native Archbishop of the Church of Uganda, something that was opposed by many Baganda then. The Baganda did not want a non-Muganda to lead the cathedral. One Sunday, Edita Nassozi Musolooza, who loved her church and served it diligently, led other congregants to close the main entrance as soon as Sabiiti arrived for prayers. Nassozi argued the land where the cathedral lies had been donated by Kabaka Muteesa I and there was no need to bring “a one Sabiiti” instead of a Muganda archbishop. Asked about this incident, Musoke said it was the bravest thing done in the cathedral’s history. “Sabiiti had brought many things we did not agree with. He was an archbishop of Uganda but wanted his chair to be brought to our cathedral, which we could not accept. Namirembe cathedral belongs to Buganda, not Uganda,” Musoke says. Sabiiti failed to access the church and Nassozi’s action led to the creation of Kampala diocese with a seat at All Saints cathedral, Nakasero, where all archbishops have since sat. Not every church minister gets buried in the cathedral grounds, but in recognition of Nassozi’s bravery, she was laid to rest in this special cemetery when she died in 2002. But to Canon Benon Kityo, the dean, the assassination of the then katikkiro of Buganda, Martin Lurther Nsibirwa, as he entered the cathedral in 1945, stands out in the church history. “He had [facilitated] the construction of Makerere University and some people did not want it yet it was helping the country’s education system,” Kityo said. Despite being a Sunday school teacher, Senfuma also managed to join the cathedral choir at 12 years, singing soprano. Senfuma adds that only ministers’ children in choir wore shoes then such as those of the late Dr EBS Lumu. The choir comprised around 40 to 50 people with the late Eriya Paulo Lwasampijja Kayizzi as the cathedral organist and master of choristers, assisted by Michael Wamala Kalule who was gunned down by soldiers in 1982. In his book, A Brief History Of The Choir And Organ Of Namirembe Cathedral, John Musoke Ssekibaala, the current cathedral director of music, describes Lwasampijja as the first Ugandan to learn to play the organ under the guidance of European missionary teachers during worship services. Namirembe, which seats 4,000 and employs more than 40 people to maintain its various structures, has baptised and wedded royalty and statesmen alike; its bells have tolled in sorrow as caskets of great men and women rolled up and down its aisles; it has seen presidents’, prime ministers’ and kings’ knees bow in prayer in its pews and if walls could talk, Namirembe would have a tale of the bombs and gunshots it has survived through the century, and the throngs that have sought shelter there from the madness of the wars outside. All this calls for celebration. In her 1894 book St Paul’s Cathedral Namirembe, Karen Moon shows that before March 1890, when the erection of the first church building began on Namirembe hill, a bishop had been murdered and scores of converts burnt to death. Despite such setbacks, the same year at Christmas, thousands of worshippers thronged the building. Namirembe hill has been a site for Ugandan Protestants since October 1889. “Upon the return of Kabaka Mwanga II from exile, he granted the CMS a piece of land at Namirembe hill. The first pole of the first church building was set up on March 11, 1890 at a plot called Kitesa,” she writes. The architect, Nicodemo Sebwato, the pokino, used traditional Ganda methods to design an 800-seater building of about 81 by 24 feet of reed work and thatch supported by tree-trunk poles. The work entirely done by local Christians saw opening of the church on a Sunday in 1890 with Bishop Tucker’s first service. In October 1894, when archdeacon Walker, of the European missionaries was in the building teaching a group of women, a strong wind blew off the roof. 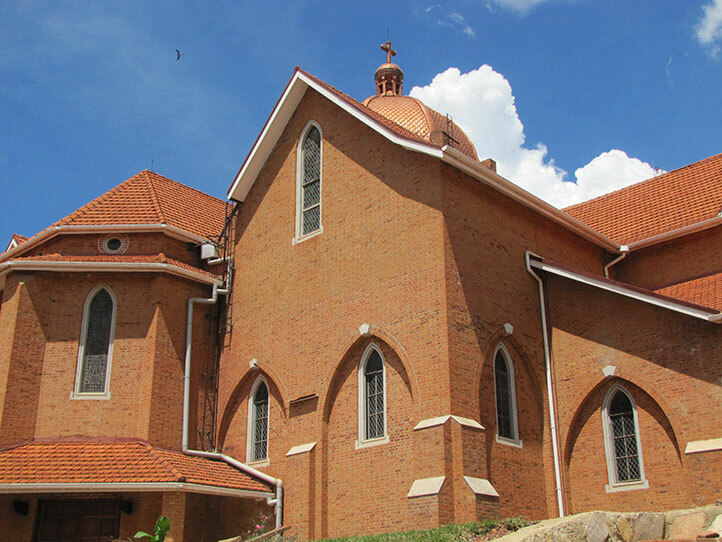 On November 21, 1894, it was agreed that the church be replaced with a similar design with Apollo Kaggwa as the architect. By 1900, the condition of the second cathedral was causing anxiety. Termites were gaining hold of the structure and it was feared it would collapse. On June 18, 1901, Kabaka Daudi Chwa laid a foundation stone to start the construction of a brick cathedral that was, however, destroyed by a fire sparked off by lightning. The fourth surviving cathedral was designed by a Briton, Arthur Beresford Pite, in 1910. Kabaka Chwa laid a foundation stone on November 8. The splendid pulpit was designed by boys at King’s College Budo. Iganga school and Mityana school made the choir stalls while six of the screens, the credence table, and altar were made by Kavirondo boys from Maseno high school in Kenya. Government, in memory of Ugandans who died in the 1914 to 1918 World War I, donated the eagle oak lectern. “The total cost of the cathedral could never be computed properly as much of the clay, timber, and labour, among others, were freely given,” Moon writes. 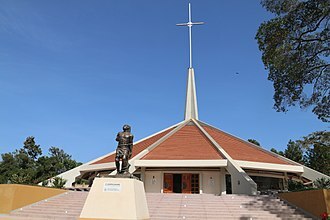 The Uganda Martyrs' Catholic Shrine at Munyonyo that is still under construction in preparation for the Pope’s visit will accommodate over 1050 Christians. The shrine is also expected to accommodate an additional 500 Christians who will sit out of the premises. This was revealed by the shrine rector, Fr. Marian Golab a.k.a Kajubi, during the tour by the Finance and Construction Committee led by the Vice chairman of the Uganda Episcopal Conference (UEC) National preparatory committee for Pope Francis’ Pastoral visit to Uganda, Archbishop of Kampala, Dr Cyprian Kizito Lwanga. He said that construction of Munyonyo Shrine is in top gear, with the Church doubling its labor, to meet the deadline of the preparations for Pope Francis’ pilgrimage to Uganda in November 27-29. “Munyonyo Church will be among the tallest buildings in the country standing at 45 meters, with a crucifix at 18 metres, and will accommodate 1050 inside and 500 Christians outside,” Golab said. Golab said that their plan is to embark on the roofing next week before plastering and painting of the facilities. “Most of the works are done but we are remaining with obtaining and fixing windows, doors and the monuments,” he said. Construction is being undertaken by SEYANI Construction International and the architectural plans by Robert Sseremba. Golab said it was at Munyonyo where Mwanga took the decision to kill all the Christians at that time. “The first phase is already done; were remaining with roofing and this week Sseremba revealed that they have doubled the labor in order to meet the set deadline. “We are working day and night to beat the deadline and our team is well equipped to meet the task in the remaining time," he said. Lwanga noted on inspection that the construction team was doing a tremendous job. “With such a spirited effort put by the workers, I am confident that works will be done before the Pope’s arrival,” Lwanga said. Lwanga said the Pope’s journey from Munyonyo will be to retrace the journey of the martyrs to Namugongo, where they were butchered and burnt. He also called upon the Christians to emulate the bravery, faith and unity of the martyrs, who died for their faith. The pope is expected to jet in the country on the afternoon of November 27, this year. The funds are to purchase several construction materials. “We call upon Christians and Ugandans to participate in programs including “YOYOOTA” the Raffle draw, where people win the Archbishop Lwanga’s Mercedes Benz; charity walk to Namugongo Martyrs' Shrine on October 31 organised by Vision Group, and purchase of rosaries at sh100,000. 130km from Lira town on Sunday. 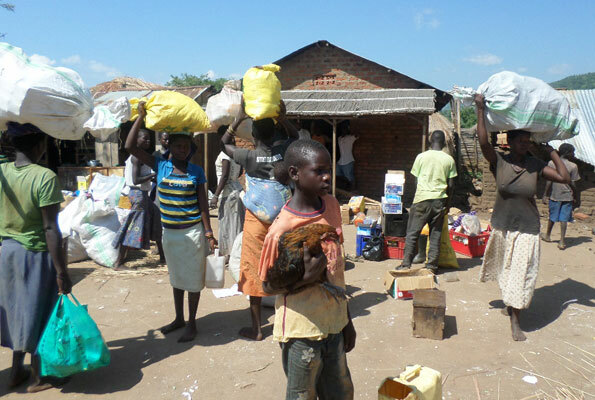 OVER 1,000 pilgrims from the dioceses of Gulu, Lira and Kotido among others have arrived in Paimol ahead of the celebrations to commemorate two Acholi martyrs, Daudi Okello and Jildo Irwa. Teddy Amolo, aged 48 from Lira diocese says she has made the pilgrimage to express her faith while Mzee Bosco Oriang aged 51 from Palabek in Lamwo district says this is the first time he is attending the celebrations. will preside over the mass. Onyango also appealed to pilgrims to be cautious about their property. Agago Resident District Commissioner (RDC) Ray Okwir assured pilgrims of security ahead of the fete. He said the police, army and other security agencies were on the look out to ensure that people are safe during the celebrations. “People will undergo thorough security checks before accessing the venue,” Okwir said. The prices of food have shot up in the areas around the venue at Wipolo, with regular meals seeing a rise of up to 30%. The Mufti of Uganda, Sheikh Shaban Mubajje, has praised the Kingdom of Saudi Arabia committee for Dawah(spread of Islam) in Africa for its generosity towards Ugandan Muslims. In a statement issued by Uganda Muslim Supreme Council (UMSC) spokesperson, Hajji Nsereko Mutumba, on Friday, Mubajje noted that the committee's move in sponsoring Islamic quiz had inspired many Muslims to study and understand their religion. According to the statement, Mubajje made the remarks on Thursday while presiding over a prize giving ceremony during which he handed over prizes to the quiz winners. Congratulating the winners, most of who were students from different parts of Uganda, Mubajje urged them to put the prizes to proper use and to be good ambassadors of dawah in their respective schools and communities. "Those of you who have won laptops and smart phones, don't be tempted to divert from dawah," he implored. There were two slots for Hajj and the winners were Lumala Tagi Ssirri from Mukono and Bashir Abduswamad, a student at Emirates College Nkowe. The Mufti of Uganda, Sheikh Shaban Mubajje hands over a laptop to one of the winers. They successfully performed their Hajj recently. Hawa Nansufu and Sharifah Namwase won a laptop each, while Dauda Kisamba, Hamid Jagenda and Murikatte Zulfa Farha each won a Quran Teaching Machine. Yusuf Nsimbe, Barrah Nakiganda and Abdul Hakim Kiranda won a Samsung Galaxy phone each. The Mufti also commended the committee's secretary general Dr. Muhammad Bin Hamad Al – Huwaidi for his decision to support dawah in Africa and prayed to God to bless him. The Uganda coordination Ccmmittee chairman Dr. Ziyad Swaleh Lubanga, who is also the UMSC secretary for Zakat said that over 2000 Muslims responded to the written quiz. He added that after examinations, a short list of 273 participants was sent to the committee for dawah headquarters in Saudi Arabia capital, Riyadh from where the overall lucky winners were picked. He thanked the Mufti for authorising the quiz in Uganda and for providing guidance to the coordination committee in Uganda. Senior UMSC management officials and prominent Sheikhs from different parts of Uganda were present. What of the mess in human rights in Saudi Arabia where human punishment is about flogging, beheading, slavery and banning women from driving a car etc... Charity begins at home. Embattled Kitgum Diocese Bishop Benjamin Ojwang is protesting the Church’s withdrawal of his official car, arguing that the move has crippled his pastoral duties. Bishop Ojwang, 63, who is the leader of the Anglican Church in Kitgum Diocese, has been embroiled in a conflict with Church of Uganda (CoU) leaders and a section of Christians in the diocese who have questioned his leadership abilities. Speaking to Daily Monitor last week, Bishop Ojwang said in December last year, the key to his official car was taken away from him. “For all this while, I have been moving on foot, or getting a lift from my friends whenever I want to carry out my pastoral work within the diocese. I want someone to explain to me why I can’t use my car yet I am the bishop and entitled to it,” he said. In a January 30 letter seen by this newspaper, Archbishop of the CoU Stanley Ntagali wrote to Bishop Ojwang, asking him to hand over the bishop’s office, official car and other assets. However, the High Court in Gulu presided over by Justice Margaret Mutonyi last month issued a temporary court injunction restraining the CoU from removing Bishop Ojwang from office. Archbishop Ntagali, in a telephone interview, however, said Bishop Ojwang is no longer the Kitgum Bishop and should not use diocese property. “In the January letter I wrote clearly that he should handover the diocese and all the properties. However, it is the court injunction that is still impeding our move to take over the diocese,” he said. OKWEJJUKANYA MU BYOKULONDA KWENSI BUGANDA ATE NENSI UGANDA.:1958/2014. 1) OKULONDA 1958 nga ensi ya Buganda yetegekera okwefuga. Okulonda obutereevu ababaka ba Uganda Parliament(Legico) kwaliwo mu bitundu ebikiikirirwa (constituencies) 10 byokka mu kifo ky’ebitundu 18 ebyali bisaliddwa mu Uganda yonna. Kuno okulonda ensi Buganda yagaana okukwetabamu. 2)OKULONDA 1961 nga ensi Buganda ate n’ensi Uganda zetegekera okwefuga. BUGANDA TEJJA KUKWATIBWANGAKO MATEEKA GA CENTRAL GOVERNMENTI EMPYA EVUDDE MUKULONDA KUNO. ERA N’OLUKIIKO TERUJJANGA KUBAAKO KYE LUTEESA NE BAMINISTA BA UGANDA ABAVUDDE MUKULONDDEBWA KUNO. Era olukiiko luno lwagoba Ababaka Abaganda 17 abenyigira mukulonda kuno nga kuliko baminista 2 ate n’Abamasaza 2. Bo Abaganda abekibiina kya Democratic Party baakkiriza okulonda era ne basobola okutwala abakiise 19 aba Buganda abe kibiina kino mu Parliament (Legico). Okuvuganya kwali nyo wakati wa DP ekikulemberwa Benedicto Kiwanuka, ne UPC ekyali kikulemberwa Milton Obote. Ebifo byonna mu Parliament eno byali 82. Aba DP bafuna ebifo 19 Buganda ate 24 ebweru wa Buganda... awamu 43. Aba UPC bafuna ebifo 35 ebweru anti nga wano mu Buganda tebakirizibwawo. Aba Uganda National Congress(Musaazi ne Baganda banne bafuna ekifo kimu(1). Abatalina bibiina(independents) Bayindi... bafuna ebifo 2. Ekifo kimu kyasigala nga kikalu. Anselimi Musoke........................................Omubaka wa South Mubende ne Gomba. Stanley Bemba...........................................Omubaka wa mu Kibuga Kampala. Gavana wa Bungereza eyali akuuma ensi ya Buganda ate ne Uganda yasanyuka nyo era n’omukulu w’Amatwale ga Bungereza n’asekera mu kikondo nga bamanyi nti kakati eby' ensi Buganda tebakyabiteesa na Lukiiko lwa Buganda ne Ssabasajja. Nga bajjanga kubiteesa n’ababaka ba National Assembly(Parliament) nebabimala kubanga n’Abaganda baalinamu Ababaka. If the church can, why not this NRM govt? Upon their invitation, I attended Kireka’s St Gonzaga sub-parish annual day and fundraising to complete this magnificent church building. St Gonzaga is on Kamuli road, which connects Kireka town to Naalya. I have not yet established why “a Kamuli road” in Kireka. Anyway, I used to stay on Iganga road in Kirinya before I settled in Bukasa. Prime Minister John Patrick Amama Mbabazi, who had been invited as guest of honour, didn’t show up. Instead, he was represented by minister of state for Ethics and Integrity, Fr Simon Lokodo (MP Dodoth, Kaabong). To prove he will not stand against President Museveni, I have been told, Mbabazi has been ordered to scale down his appearance at public functions. Good thing is, he sent a written speech and pledged Shs 5m. In this written speech that Lokodo read for him, Mbabazi warned the church against working with the opposition. He reasoned that the work of the opposition is to find fault, so they can remove the existing government and replace it, yet thework of the church is service delivery. The church and the government must, according to Mbabazi, work together because their duty of service delivery is similar. St Gonzaga is the second biggest Catholic church in Kireka, newly-crowned St Matia parish on Kinawattaka road, near the police’s Special Investigations Unit, being the biggest. When completed, St Gonzaga will have consumed more than Shs 500m, all raised locally from church-goers and a few friends. The people’s will and enthusiasm to donate towards the construction of their church is amazing. Transparency and good leadership are the key points I mentioned in my speech, when I was given an opportunity to say something. On the side of government, St Gonzaga is the equivalent of a village administrative unit, like LC-I. The LC-I here is without a permanent office. In fact, it is housed in a makeshift wooden structure. To get church services, you walk into a magnificent building and yet for government, you crawl into a wooden makeshift structure! Mind you, the church depends on small donations that are not compulsory, yet the government levies and forcefully collects taxes. Why would people donate Shs 500m to build a church and not Shs 100m to construct their area village office? This example is local but it tells you a lot about the disintegration of government. St Matia has just been elevated from a sub-parish to a full parish during a function presided over by Vice President Edward Kiwanuka Ssekandi. St Matia sits on more than 10 acres and runs schools as well. Fr Leo Bagenda of Bweyogerere, whose parish has fathered St Matia, told me that St Gonzaga is also about to become a parish. I am not saying there are no issues in the church. Certainly they are there, but the institution remains an inspiration. Kireka is one of the fastest-growing towns, the whole of it now almost covered in buildings. But there is, at the moment, no physical plan for this town. A cigarette factory has been established in the middle of a residential/commercial area. And because MPs are the only visible administrators, an old woman promised to punish me in 2016 if cigarette-making activities are not removed from her residential area. Yet there are no signs of improvement with Mr Museveni still head of state. Many local government administrations are still housed in buildings belonging to the Buganda government. But instead of acquiring land for future use, Museveni’s is a selling government. The FDC Vice President Salaamu Musumba calls it subsistence. The government doesn’t plan beyond the next election. I bought a piece of land in a village called Bulimu in Mukono, along Bugerere road. This land is some kilometres off the main road. I was amazed to discover that the Catholic church has already acquired land there. 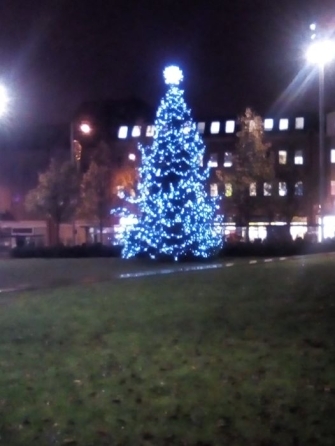 When this area begins to urbanise, the church will simply develop its land. It is also important to note the fact that there is a clear procedure regarding how units can attain a higher status. Fr Leo Bagenda of Bweyogerere told me that St Gonzaga will graduate from being a sub-parish to a parish when it proves that it can sustain itself. On the government side, today for something to become a town board, town council or municipality, it depends on the goodwill and interest of the leaders.There is no due process, just a declaration by the supreme leader during a campaign rally. There is no motivation to grow because even when you do so, you remain the same. Why on earth should Ntungamo or Ishaka-Bushenyi be elevated to municipalities and yet the whole of Kira, which comprises Kireka, Kyaliwajjala, Bweyogerere, Kirinya, Najeera, etc., remains a town council? I am actually left with no option but to think that the total lack of governance at lower level is deliberate so that everybody can run to State House. book on electoral reforms in Kabale Town recently. 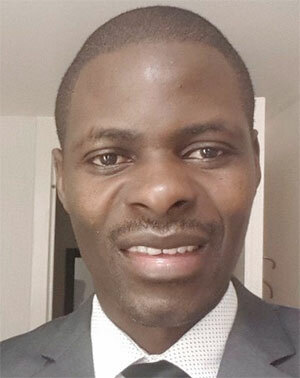 Kabale, Uganda, Western Province - The Kabale Resident District Commissioner (RDC), Mr Darius Nandinda, has appealed to bishops in Kigezi sub-region to restrain serving priests from engaging in partisan politics. He said such action divides their flock along political affiliations. Mr Nandinda was addressing a press conference at his office on Thursday where he argued that priests involved in partisan politics have lost track of their pastoral work of providing spiritual guidance to their flock. “I am not stopping priests from participating in the politics of our country. But for purposes of harmony amongst their flock, they should pass their views through the area members of Parliament and local leaders to demand services for their people but not involving themselves directly in partisan politics. Talking politics to people who have come for spiritual healing is dangerous,” Mr Nandinda said. “I am drafting letters to the bishops of Kigezi Diocese and Kabale Diocese, asking them to restrain their priests from partisan politics in order to save the integrity of the church. Issues of Father Gaetano Batanyenda, a serving priest at Kitanga Catholic Parish, using the church platform to promote the Opposition and claiming that he is a member of the NRM party should stop,” he added. Mr Nandinda said the continued association of Fr Batanyenda and other priests supporting the Opposition and using the church platform to criticise government should not be interpreted that all Catholics in Kigezi oppose the NRM government. Fr Batanyenda is the head of clergy at Kabale Diocese, which covers all the districts in Kigezi sub-region, and also the parish priest for Kitanga Catholic Church. In response, Fr Batanyenda said refraining serving priests from partisan politics is good but it should be applied across the board. He said serving priests criticising the NRM should not be labelled partisan while those supporting it are glorified as patriots. “The involvement of serving priests in partisan politics is bad but priests have the rights to preach about good and bad leadership of their country. Why is it that the priests campaigning for NRM government are glorified while those of us criticising it are called partisan and associated with Opposition political parties?” Fr Batanyenda asked. “When I was criticising the Obote regime, the NRM leaders were thanking me for the good work well done and always urged me to continue. Now that I am criticising their government, they are calling me a bad person. Besides preaching the Bible, as a priest, it’s my duty to show the flock the right direction to take to avoid being eaten by hungry lions,” Fr Batanyenda added. He asked priests involved in advocacy for good leadership in Uganda to stand firm and reminded them that in future they will be remembered and honoured like former Archbishop of Uganda Janani Luwum. Religious leaders under the Inter-Religious Council (IRC) yesterday flagged a 16-point blueprint to help them set the stage for next year’s elections and warned that commercialisation of the electoral process will be disastrous for the country. The clerics, while addressing journalists at the IRC headquarters in Namirembe, Kampala, also said despite regular implorations by some political figures urging them to stay away from matters of politics, they are “citizens of Uganda” and have a role to play in shaping the country’s agenda. “Cognisant of the important role we played before, during and after the 2011 elections to ensure peace and stability, we, as religious leaders at our meeting recently, agreed on some points to guide us,” Church of Uganda Archbishop Stanley Ntagali said. The 16 points include praying for the country, being guardians of the common good, creating and strengthening impartiality and independence of the spaces of dialogue, distancing from the company of partisan religious leaders, and strengthening of mutual accountability. He also urged faith-based leadership to limit or suspend fundraising activities in places of worship during the election season. “This has the potential to compromise our prophetic voice and undermine our impartiality and independence,” he noted. The Born-Again Faith leader, Pastor Joseph Serwadda, revealed IRC’s plans of having dialogues with aspirants. “We are of a view that as religious leaders, we should get the opportunity of addressing the political candidates on challenges along their paths,” he said. Urging government to expedite constitutional electoral reforms. when 26 Balokole students were expelled from the college. The Balokole are widely recognised as one of the most significant Christian movements in Uganda and East Africa as a whole.Balokole is a Luganda word meaning “saved people”. In Uganda, it started as the Revival Movement in the Anglican Church. The movement also has links in Rwanda, but its roots are firmly found in Buganda with strong ties to the Church of Uganda. The Revival Movement was started in the 1920s as a quest for holiness by Simeoni Nsibambi, a wealthy Muganda landowner in Mengo. Nsibambi established a bond with Joe Church, an English doctor, who belonged to the Church Missionary Society (CMS) Rwanda Mission. This is how the movement got to have links with Rwanda, which was not a British colony. It was through this partnership that a number of youth from Buganda and western Uganda went to work at the mission hospital in Gahini in Rwanda. They started coming back to Uganda in 1935, more revitalised in their new belief and ready to take on the church establishment in Uganda. Much as the Church of Uganda welcomed the idea of the Revival Movement, it became a hot potato for the church at some point. In 1941, the relationship between the church and the movement reached its peak when 26 Balokole students, who were referred to as “bajeemu rebels”, were expelled from the Bishop Tucker College in Mukono. They were training to serve in the church ministry. By the 1950s, the Revival Movement had become an integral part of the Church of Uganda, producing church leaders such as Archbishop Janani Luwum, and Bishop Festo Kivengere. The Mukono crisis of 1941 came about as a result the disagreement between the Balokole and the main stream Anglican Church over the interpretation of the Bible. The Balokole wanted a strict and conservative way of biblical interpretation. The crisis can be traced from the earlier colonial days and the position of the Anglican Church in Uganda. The triumphant Protestants over the Catholics and Muslims in the religious wars of the 1890s made the Native Anglican Church (NAC), also known as the CMS in Uganda, to become the dominant political religion in the colony. This created a strong bond between the ruling chiefs and the church. This was further consolidated by Bishop Willis during his time in Uganda between 1912 and 1934. It was these political ties that created tension in the Church. This had implications in the spread of Ganda political imperialism to other parts of Uganda. The enthusiasm of the Revival Movement believers did not agree with the worldliness of the Native Anglican Church. One such people was Mabel Ensor, an Irish woman, who in 1928, left the Anglican Church to start her own fellowship called the Mengo Gospel Church. This was a protest against the worldliness of the NAC. She was opposed to the modern teachings as advanced by the Bishop Tucker College. At the centre of such liberal teachings was John Jones whose views were a major issue in the 1941 crisis. He was warden of Bishop Tucker College. At that time Ensor’s informant at the college was Besweri Galiwango, one of her former workers. The missionaries in Uganda were very conscious of the spiritual weakness in the Church in Uganda, with the cause of trouble being the poor quality of the clergy. Attempts early in the century to combine high school and theological education at King’s College Budo had come to nothing because theological education had to rely on the meagre resources of CMS and the local church. The CMS-founded schools on the other hand produced well educated lay elite, while the clergy from Bishop Tucker College, which opened in 1913, were the opposite. Writing in the book A History of Bishop Tucker Theological College, Kevin Ward says: “Besides training pastors, it also had a normal school for training vernacular teachers. When Bishop Willis tried to introduce an English ordination course in 1929, the move was met with a lot of resistance and hostility from the local clergy. By then Budo was the likely source of new entrants to the English ordination course. Among the first to join this class was Erica Sabiiti, the first Ugandan archbishop, and Blasio Kigozi, a brother of Simeoni Nsibambi. In 1939, three other Budonians – William Nagenda, Eliezar Mugimba and Erisa Wakabi – who went on to become leaders of the Revival Movement at the college, were sent to Mukono by Bishop Stuart. However, they were dismissed two years later. At the college, the new group formed a formidable team of the Balokole under the guidance of Nagenda. One of the characteristics of this group was that they met every morning before dawn for prayer and praise. These meetings did not meet the approval of the warden and he threatened to ban them. During the 1941 Easter holiday trip to Tooro with college chaplain Benoni Kaggwa, the Balokole renounced the sinful life at the college and vowed to fight it once the returned to Mukono. Daily preaching by Balokole students against the sins they claimed were eating up the college became the order of the day. To non-Balokole students, this was a source of concern as they complained that the Balokole were avoiding communal work. The warden intervened by putting the issue of public preaching to a vote. The non-Balokole took the day with 83 votes against 44. However, the preaching continued with the Balokole vowing to obey God, and not man. During a general assembly on October 22, 1941, the warden warned against indiscipline and disrespect for the law. He went ahead to introduce new rules to curb the increasing indiscipline at the college. Among these included barring students from leaving their beds before 6am. The Balokole saw this as an attack on their freedom since they started their praise and warship at 4am. The Balokole disobeyed the new rule and continued with their morning prayers with support from the chaplain. Just a day after the new rule was put in place, the Balokole students disobeyed and the warden reacted by dismissing chaplain Benoni Kaggwa for misleading the students. But this was not threat enough to deter the determined Balokole students. Two of the students apologised. Others admitted having heard the rules but deliberately disobeyed them and were not willing to apologise. The unruly Balokole students followed the chaplain, who led them to the archdeacon to go and appeal their dismissal. Unfortunately, their appeal fell on deaf ears. The warden was willing to allow them back to the college only if they were ready to make an unconditional apology. But they were not ready to do that and they had to leave the college. Once the confrontation had finally erupted, it was difficult for the warden to modify his intransigent stance. And once the Balokole responded with equal intransigence, Jones could not back down. He demanded that there be an unreserved apology before a student could be reinstated. Among those expelled, 15 were Baganda, five were from Ankole, four from Bunyoro and one was from Kigezi. There were no bajeemu (rebel) students from northern and eastern Uganda mainly because at the time the two regions were not part of the diocese of the Church of Uganda. They were under the diocese of the Upper Nile with its clergy being trained at Buwalasi in Mbale. The leader of the expelled students, William Nagenda, insisted that God was calling his group not to join the ordained ministry, but to work as lay evangelists. He moved to Namutamba where he lived the rest of his life as a lay evangelist. Some of his colleagues like Wakabi, Magumba and John Musoke apologised and went back. 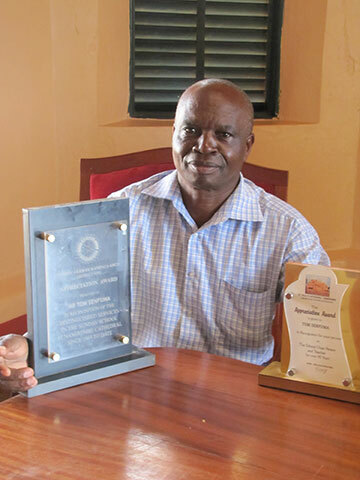 William Nagenda was born into a large family and his father, Festo Manyangenda, was a respected Muganda chief who lived on Namirembe hill, Kampala, Uganda. After primary school, he attended King’s College, Budo, from where he went on to acquire a diploma at the University College of Makerere. Prince Kassim Nakibinge speaks at a function in Kubuli recently. The titular leader of the Muslims in the State of Buganda, Prince Kassim Nakibinge, has hit back at Sheikh Ramadhan Mubajje, cautioning him not to step beyond his limits. While speaking at the celebrations to mark 120 years since the late Prince Nuhu Mbogo returned from exile in Zanzibar, Prince Nakibinge slammed Mufti Mubajje for earlier statements he made while attending a Duwa function in Mbarara District. 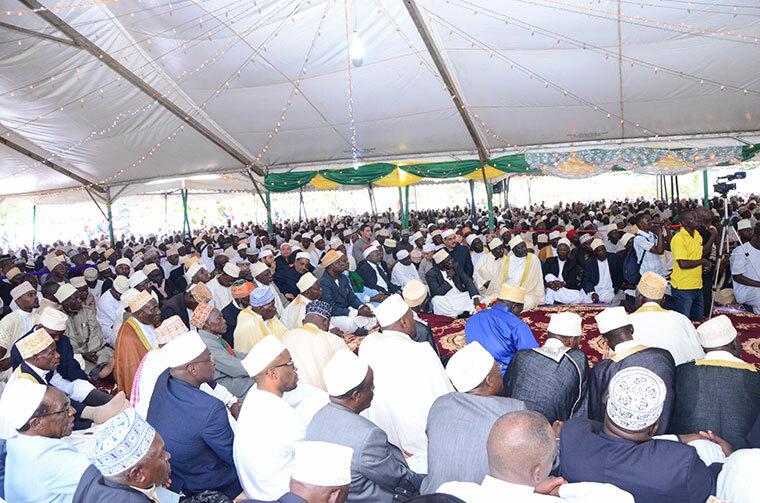 At the Duwa function about a month ago, Sheikh Mubajje, the Mufti of Uganda, cautioned the Kibuli faction, currently under the guidance of Prince Nakibinge, against “coining differences” among the Muslim community in Uganda. While giving a sermon at the function, Sheikh Mubajje said Prince Nakibinge had never kept with him any Muslim property and he should therefore stop demanding anything from him. “[Prince] Nakibinge never gave me Muslim properties, neither did he appoint me as a custodian of those properties. Therefore, he should stop demanding from me for things he never made me a custodian,” said Sheikh Mubajje. “People like Sheikh Mubajje should know their limits. This [Mbogo] home is a historical and a revered place. Therefore, if Mubajje thinks he can erase such history, then he must be very careful of the outcome,” Prince Nakibinge warned. In a similar tone, Sheikh Nuhu Muzaata asked Sheikh Mubajje to exempt himself from matters to do with the historical home of Prince Mbogo if he wants peace with the Muslim community. “When I hear people like Mubajje, who do not have any mark in Uganda’s history talking about this [Mbogo’s home], then I wonder. They are inviting trouble for themselves,” said Sheikh Muzaata, the director of Dawah in the Kibuli-based Muslim faction. 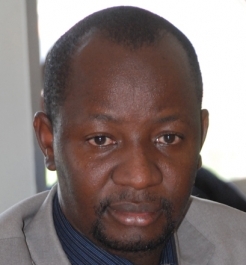 However, the Uganda Muslim Supreme Council (UMSC) spokesperson Hajj Nsereko Mutumba defended the Mufti’s position, saying there was no wrong in the Mufti’s statements. “As UMSC, we respect hereditary leaders because they are born with that respect. But our leadership is bound by qualifications. Therefore, they should also know their limits because they cannot be the Mufti of Uganda as of this reign,” he observed. Since 2006, Muslims have been pushing for Mubajje’s exit, accusing him of illegally disposing of Muslim community property without the consent of the council. The matter ended up in court, with Sheikh Mubajje, businessman Hassan Basajjabalaba and Dr Edrisa Kasenene facing criminal charges. The matter ended up dividing the Council members into two groups and with some members such as Sheikh Mahd Kakooza being expelled. It is these wrangles that made the Kibuli faction elect their own Mufti. ABATABBULIIKI okuva mu mizikiti egy’enjawulo mu Kampala bakungaanidde ku kitebe kyabwe e Nakasero ne beewerera Omulangira Kassim Nakibinge n’obukulembeze bwe bwonna e Kibuli nti, bwe busibisa Bamasheikh baabwe. Bakubisizza ebipande kwe bawandiise ebigambo ebirabula Omulangira Nakibinge era ne basaba Pulezidenti Museveni abasalirewo eggoye mu bwangu ng’ensonga tennasajjuka kwanganga Kibuli. Mu Juma eyabaddewo ku Lwokutaano, akola nga Amir Sheik Yahaya Mwanje yasoose kubalombojjera nnaku abasibe baabwe gye balimu n’abasaba basalire wamu amagezi okubataasa. Amir Mwanje yabagambye nti, yasisinkanye Omuduumizi wa poliisi Gen. Kale Kayihura era n’amukkiriza okusisinkana Bamasheikh abali mu kkomera n’akkiriza n’okuyimbula omwogezi ku Muzikiti gwa William, Umar Kamoga. Agamba nti, yayimbuddwa kyokka teyawezezza lunaku bweru n’addamu n’akwatibwa.Yalombozze nti, ekyazzeemu okumukwasa, abamu ku bakulembeze okuva e Kibuli baalabudde Kayihura okumuloopa ewa Museveni singa taddamu kukwata Umar Kamoga. Ebigambo bya Mwanje byasiikudde emitima gy’Abatabbuliiki ne bakambuwala era buli gwe yawadde akazindaalo ng’ayogeza bukabwe ate abamu ne bakaaba. Waliwo ekibinja ekyabadde kikutte ebipande ebivumirira oba kulembeze bw’e Kibuli ku byonna ebiriwo. Omu ku bateesa Dauda Ibin Mohamed yagambye nti enteeseganya wakati w’ebiwayi ne Pulezidenti Museveni tezikyayamba. “ Amir yita olukiiko lw’Abatabbuliiki bonna ne mu byalo ensonga tuzikwate na maanyi. Ssebo Amir ffe twetegese”|, Dauda bwe yagambye. Abalala baasabye Amir abakkirize balumbe Kibuli bubeefuke kubanga babanyigirizza ebbanga ddene nga babalumiriza okutta ate nga tewali bujulizi. Sheik Abudallah Twawiru yateesezza nti, ensonga z’Obusiraamu zeetaaga kutwala ku Kaaba gye zisobola okuggweera. “Okusowagana tewali kisobola kukumalawo okuggyako nga Basheik bakkirizza okusisinkana ku Kaaba ffenna ne tuloopa, Allah n’atusalirawo. ”, Twawiru bwe yagambye. Ate abakyala baagambye nti nabo beegasse ku basajja mu lutalo lw’okuyamba Basheik era baaweze okwegatta ku basajja okulwana wadde babalaba nga bambala Hijabu bagenda kuziggyako battunke n’ababalwanyisa. Okusaala kwetabiddwaako n’akulira poliisi mu Kampala n’emiriraano Siraje Bakaleke eyabasabye okuba abakkakkamu era beeyongere okukolagana ne Gavumenti. Bino we bijjidde nga poliisi eri mu kaweefube okuzuula abatta Bamasheikh. Nakibinge yassibwa ku lukalala lw’abalinze okuttibwa era eyasembyeyo okuttibwa ye Sheikh Hassan Kirya eyali akola nga omwogezi w’e Kibuli. Bamasheikh ab’e Kibuli abalala abattiddwa kuliko, Musitafah Bahiga ne Sheikh Abdu Karim Ssentamu.